This property is an extremely good buy for the money. It is situated in the village, but the road that runs to Topolovgrad runs past the bottom of the lane, a few metres from the boundary of the property. This is good buy, just for the location. 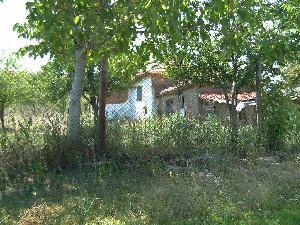 The property has a well and around an acre of land. It has extensive out houses and the property itself is in average condition. Kanajavo is a village not far from Elhovo. This is a popular village with the English, although due to it?s layout does seem to retain its original feel. It is on the junction that connects the larger towns of Elhovo and Topolovgrad, these are both nice towns, and the travelling distance to either of them is around 15 minutes. The prices quoted on all our properties are fully inclusive of Company Formation, Solicitors Fees, Notary Fees, All Taxes, Travel & Commission The price you see is exactly what you will pay, You will endure no additional costs. We always have a good selection of properties for sale Bulgaria. Bulgarian properties remain a top choice for people looking for both investment and holiday homes. If you are thinking about buying property in Bulgaria and perhaps renovating, please click on the building tab on the home page. If you cannot see what you are looking for on the web site, please contact me. I am always able to find exactly what my clients are looking for. Bulgaria property investors are doing very well at present. The rate of growth is outstripping all expectations, this is thought to be the due to the imminent entry into the EU.